I’m not much of a morning person. But if something tasty is waiting for breakfast, it makes waking up early a bit easier. I don’t necessarily mean eggs and bacon, or stacks of pancakes, though they can be potentially motivating as well. I find comfort in knowing that there is a simple, but delicious breakfast bread just waiting to be toasted and smothered with honey. Healthy? No. Promotes cheerfulness? Yes! Not to mention a perfect complement to that morning coffee. Preheat oven to 350 degrees. Grease two 9x5x3 loaf pans. Cream together butter, zest, and honey for Orange Honey Filling. Roll dough into a large square, 1/4 inch thick. Brush with melted butter. Spread thinly with Orange Honey Filling. Scatter crushed walnuts, candied orange peel, and raisins over dough. Roll up jelly-roll style. With a rolling pin, press filled dough down to a thickness of 1 inch. Divide flattened dough lengthwise to make three long strips. Cut in half to make 6 shorter strips. Braid cut strips together to make 2 loaves. Fit each loaf into a greased pan. Let rise until dough doubles in bulk. 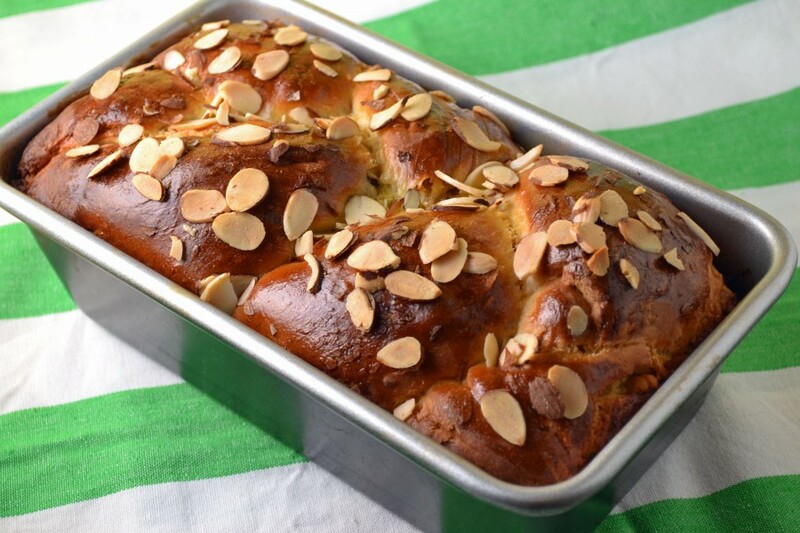 Brush with egg yolk mixture and scatter almonds over loaf twists. Bake in preheated oven about 45 minutes, or until golden brown.